Already back in ancient Greece, the city states battled each other and external powers, as discussed in the first play that has been preserved, “The Persians” by Aeschylus, produced in 472 BC. Then the Romans conquered half of Europe with their military might. And when the Roman Empire collapsed, local leaders everywhere started fighting against each other in perpetual attempts to enlarge their territories, until this eternal war in Europe culminated in two World Wars. It was only after these ultimate disasters that institutions were created to prevent wars in Europe: the OSCE, the Council of Europe, and, by and by, the European Union. For theatre buildings, war only means destruction. 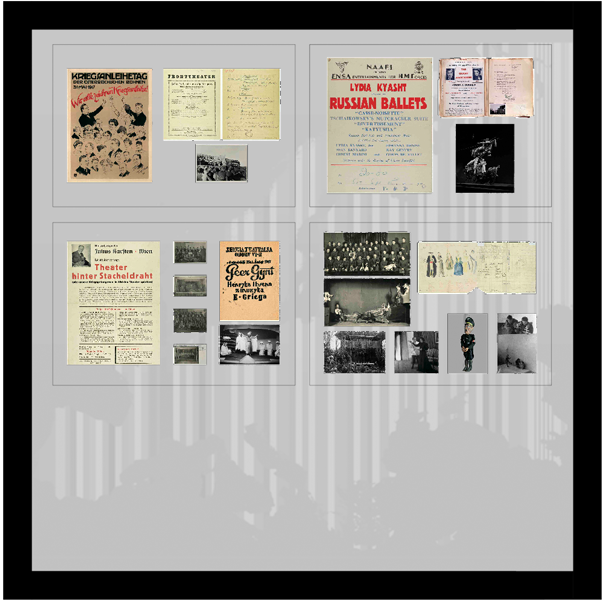 But theatre performances prevailed even in times of war: from propaganda theatre to partisan theatre, from emigrant theatre to performances in prisoner-of-war camps. Proof that for Europeans theatre is an essential mode of expression even under the most difficult circumstances. War bonds are debt securities issued by a government to finance military operations and other expenditure in times of war. For the Austrian-Hungarian Monarchy and the German Empire war bonds were the most important funding instrument. During World War I also theatres made propaganda for war bonds. 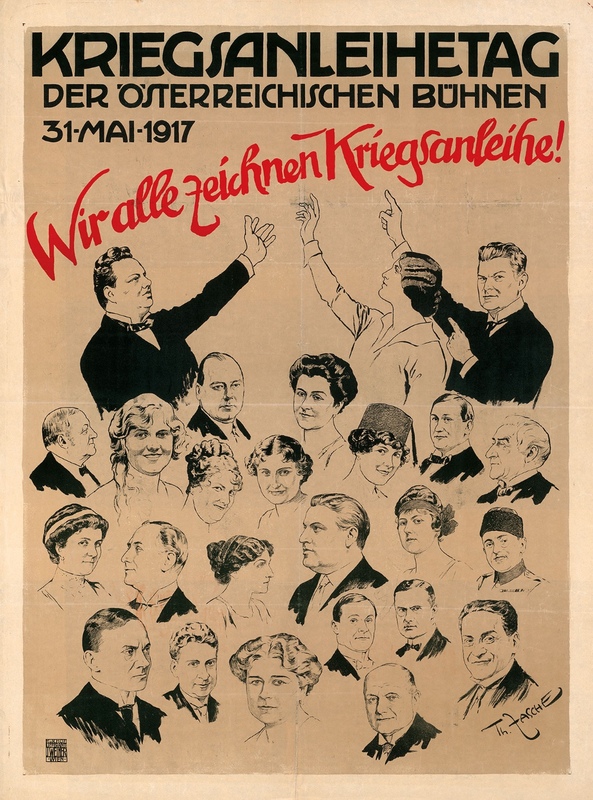 The poster tries to make this argument by presenting popular members of the Viennese theatres who say: “We all sign war bonds!” The fall of the Austro-Hungarian Monarchy in 1918 made all the war bonds worthless, and finally, during the hyper inflation in 1923, they were completely invalidated. Theatre as a means of entertainment for the soldiers at war has a long tradition starting already in Roman times when travelling artists and actors accompanied the military forces. Therefore the front theatre during World War I was not a new idea, but starting with this war theatre became part of a professional propaganda machinery and was a recognized instrument of psychological warfare. 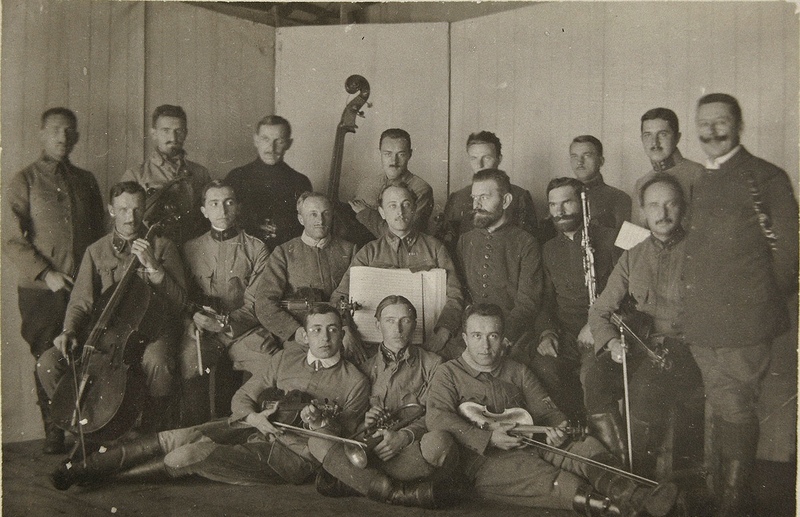 For the Austrian-Hungarian military forces the tours of the various theatre ensembles were organized by the imperial and royal war press bureau; the theatre groups presented mostly light entertainment. 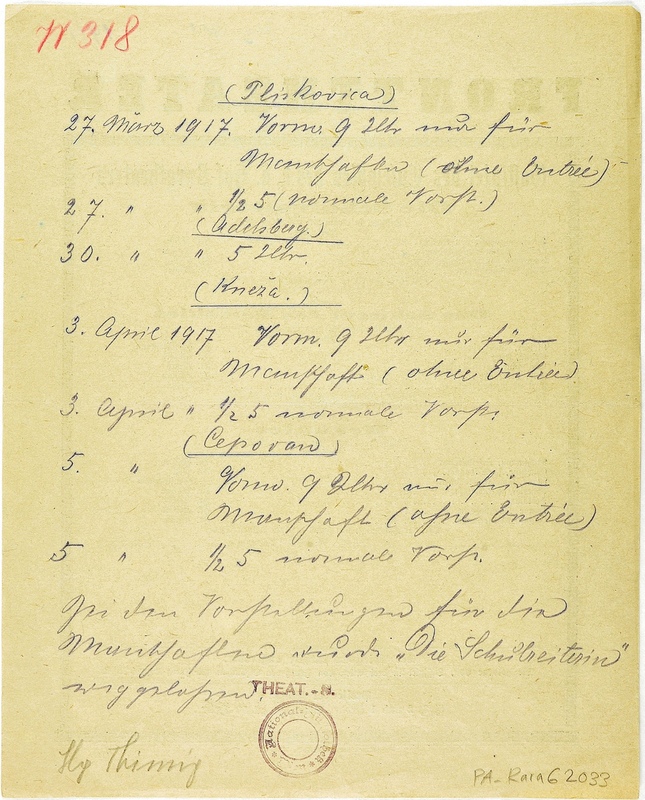 The playbill announces three short and funny plays by the national theatre Burgtheater, and on the backside the dates and venues are noted. Troop entertainment had become a recognized instrument of psychological warfare already during World War I. During World War II it was regarded as even more important, and not only the army command took care of it. In Nazi Germany e.g. 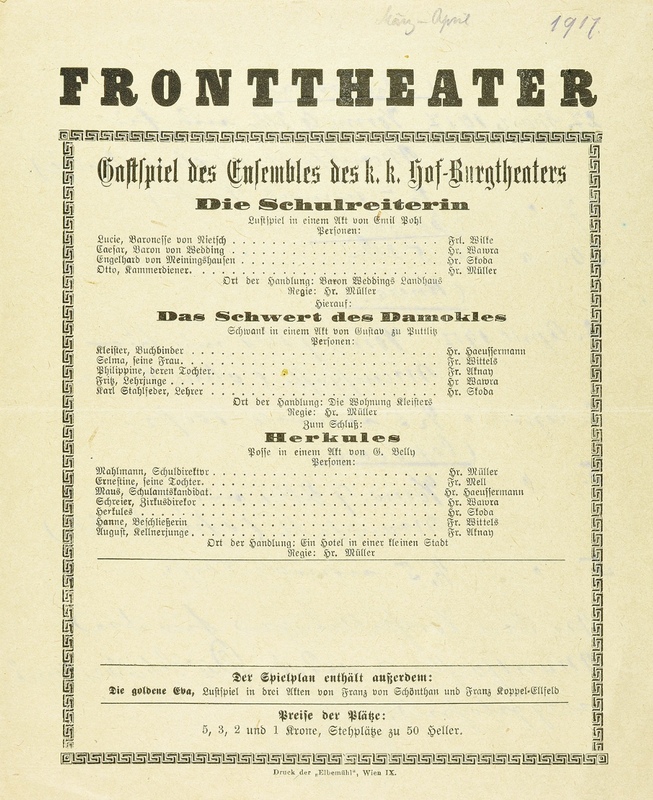 front theatre was planned by the Ministry of Public Enlightenment and Propaganda and carried out by “Kraft durch Freude” (“Strength through Joy”; abbreviated KDF), a Nazi organization that was set up in 1933 to provide affordable leisure activities and holiday trips for the working class. When the war began in 1939, the KDF had enough experience and financial means to provide troop entertainment in a most professional way. 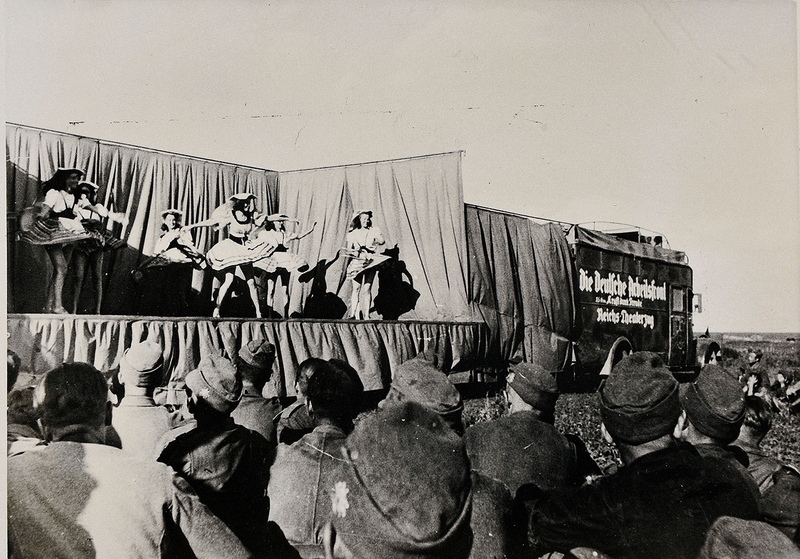 The photograph shows the “Reichstheaterzug”, which was a theatre train that brought artists and actors not only to the countryside but also to the front. The actor Julius Karsten served during World War I in the Austrian-Hungarian army. In September 1914 he was wounded at Rawa Ruska, taken prisoner and deported to Siberia. In 1915 he established his first camp theatre in Krasnoje Riecka (north of Vladivostok). 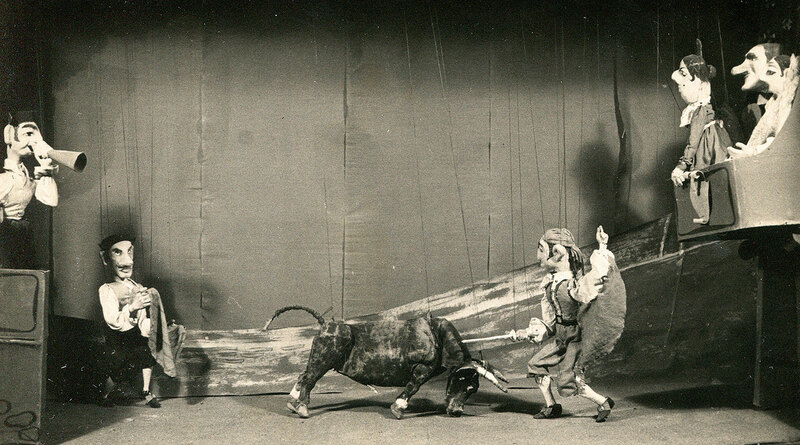 In 1918 he established a second camp theatre in Novonikolayevsk (today: Novosibirsk). In 1920 he managed to escape and returned to Vienna. In 1936 he created a slide show lecture on his POW camp experience and toured in Austria and other German speaking countries. On the one hand he described the horrors of war and camp life, on the other hand he explained how the camp theatre saved fellow prisoners from desperation and how it improved the interaction between the captives and the camp authorities. The POW camp theatre in Novonikolayevsk (today: Novosibirsk) was established in 1918 by the Austrian actor Julius Karsten. 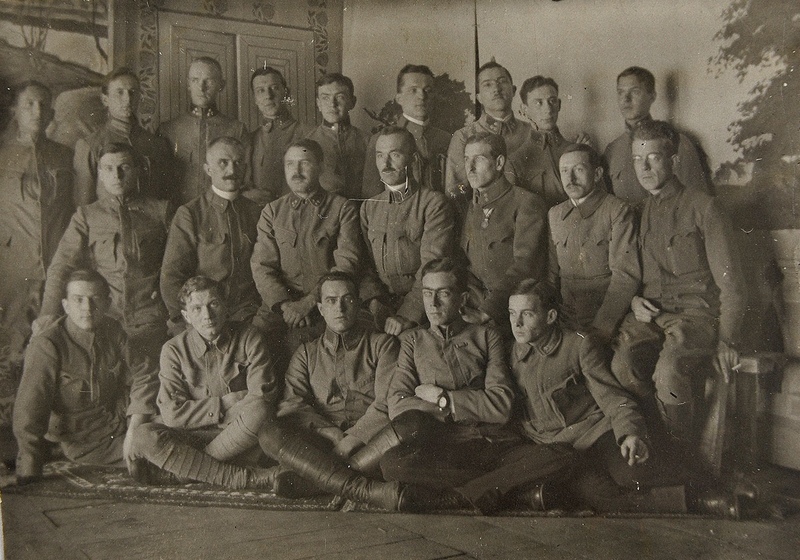 He had served during World War I in the Austrian-Hungarian army. In September 1914 he was wounded at Rawa Ruska, taken prisoner and deported to Siberia. The resources for theatre production in the POW camps were always quite small and mostly improvised. In some camps they reached with the allowance of the camp commander a quite professional standard, e.g. with a building especially dedicated to theatre and an own orchestra. 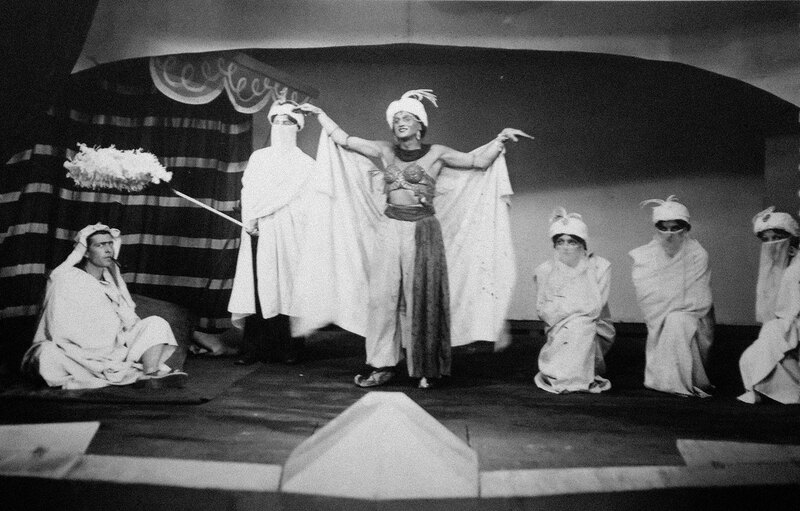 The camp theatre productions improved the situation of the prisoners in various ways. They offered distraction from the exhausting life in the war camps. The camp authorities welcomed the cultural efforts and visitors were invited to see the performances. With the entrance fees the prisoners could afford to buy additionally necessary things for their living. 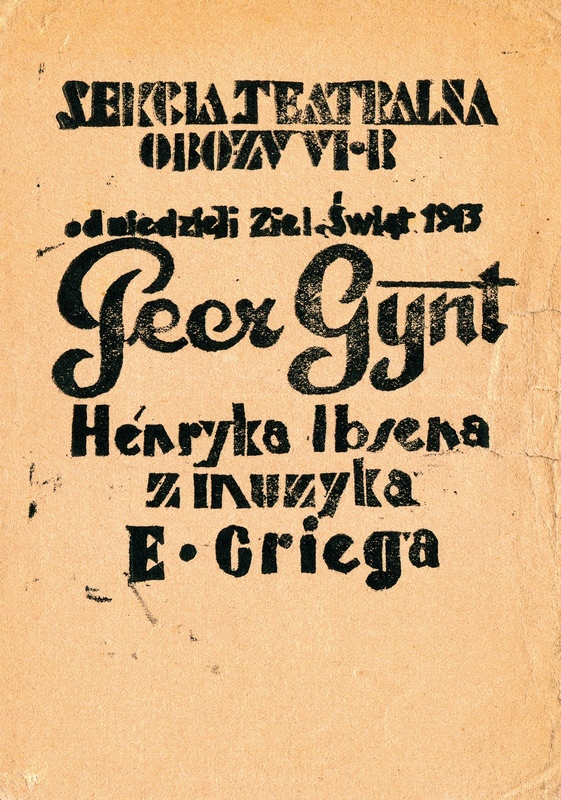 The leaflet advertises a performance of Ibsen’s play prepared by Polish POWs in the POW Camp VIB Dössel in Germany. 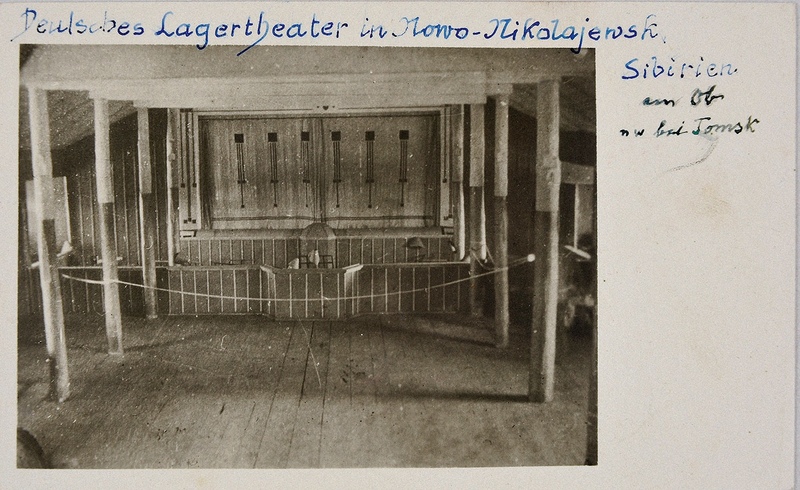 The photo catches a moment of the oriental scene in Ibsen’s play “Peer Gynt”, as performed by Polish POWs in the POW Camp VIB Dössel in Germany. 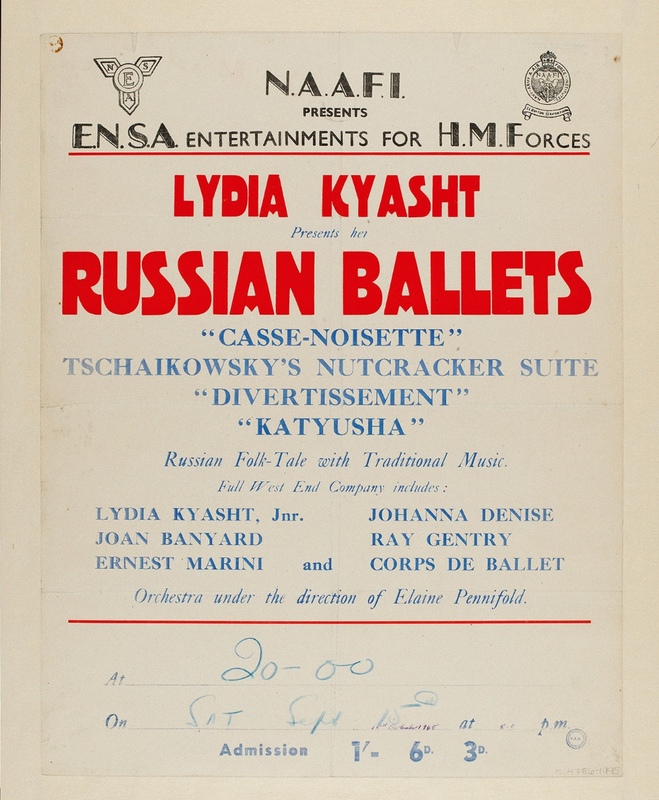 This poster advertises an ENSA show by the British ballet company Lydia Kyasht. She was a Russian solo ballerina at the Marinsky theatre who had established herself in England in 1908. Performing with Diaghilev’s Ballets Russes several times, she created her own company in 1939. Although ENSA was nicknamed “Every Night Something Awful”, due to the occasional lack of professionalism from some of the performers, this poster shows that quality entertainment was still available during the war. 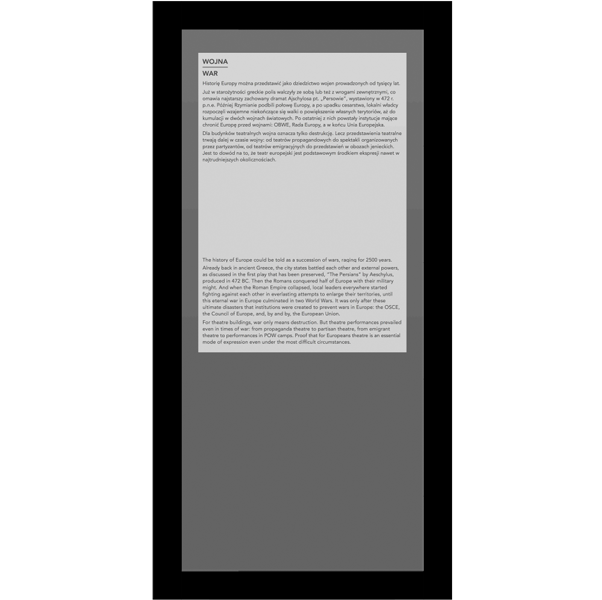 This poster shows minimal graphic flourishes, due to paper and ink restrictions during wartime. The lack of indication of venue is deliberate, to prevent information falling into the hands of the enemy. 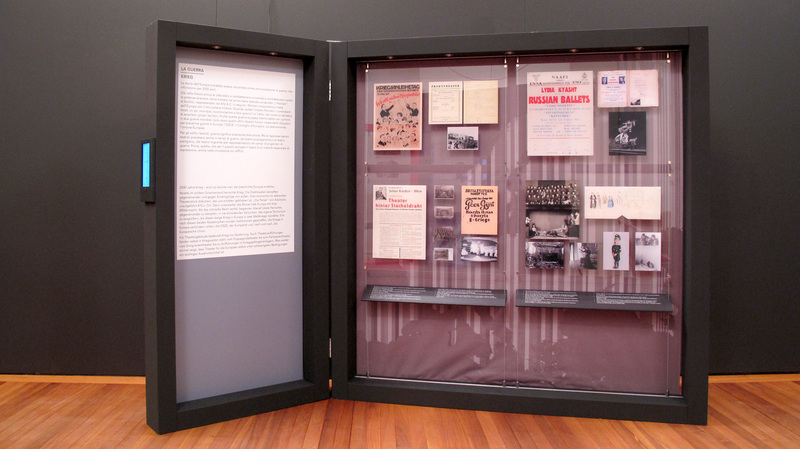 The scrapbook was created by James Grant Anderson while he was touring with ENSA, and recording his company’s shows and travels. The Entertainment National Service Association was created at the outset of WWII to provide entertainment for displaced populations in England and for British troops on various fronts. 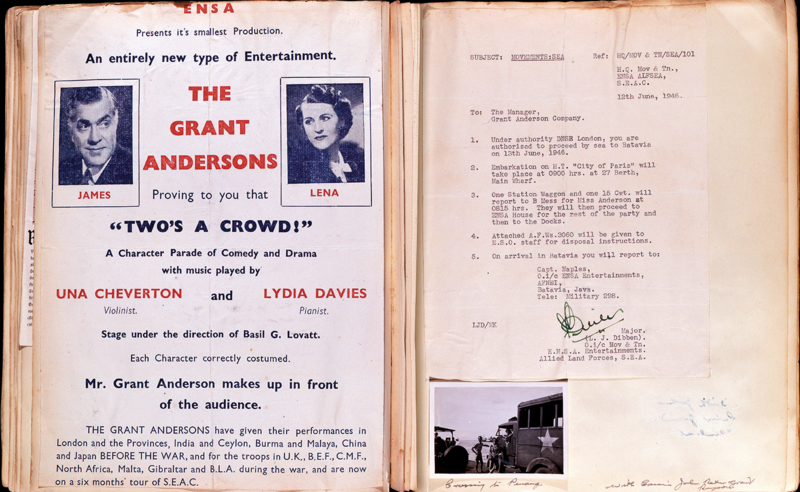 The Grant Andersons were a company of comedians who created humorous shows, involving impersonations and transformations on stage into a variety of characters. The scrapbook also holds flight details, notifications, tickets for the shows and an invitation to the Officer’s quarters. Based in the Royal Theatre, Drury Lane, the ENSA, under the aegis of the Navy, Army and Air Force Institute (NAAFI), produced over 2.6 million shows between 1939 and 1946, sending performers to places as far afield as India, Japan and Algeria but also to stations in Malta, Germany and Italy. Here the Grant Andersons were sent to Java to entertain troops stationed there after the end of the war. The photograph shows the ENSA emissaries ready to cross the channel from mainland Malaysia to the island of Penang. The woman is probably Lena Grant Anderson and she is shown wearing the ENSA uniform – as member of the armed forces, performers submitted to the same rules as the military. 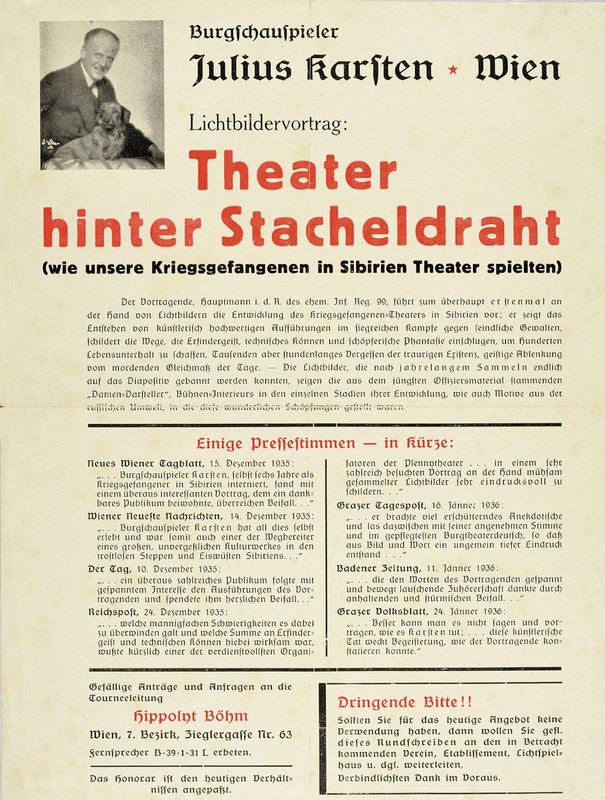 This production of Münchner Kammerspiele (8/10/1950) was staged by Bertolt Brecht himself, with the famous actress Therese Giehse who had returned to Munich after her exile. The play examines human patterns of behaviour and attitudes in wars. Brecht had written the play “Mother Courage and Her Children” already in 1938/39. 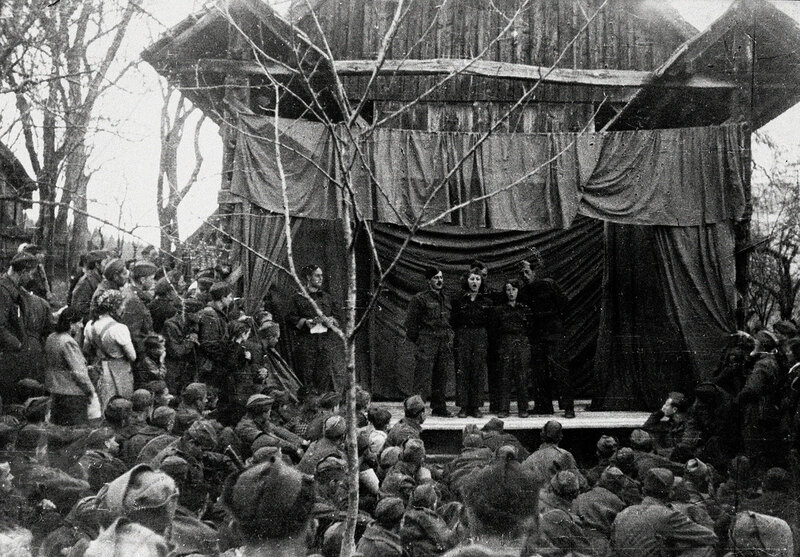 Puppet theatre company of Polish POWs, directed by H. Ryl, after a performance of “Torero's Mother-in-law” at POW Camp VIIA Murnau, Germany, in WWII. 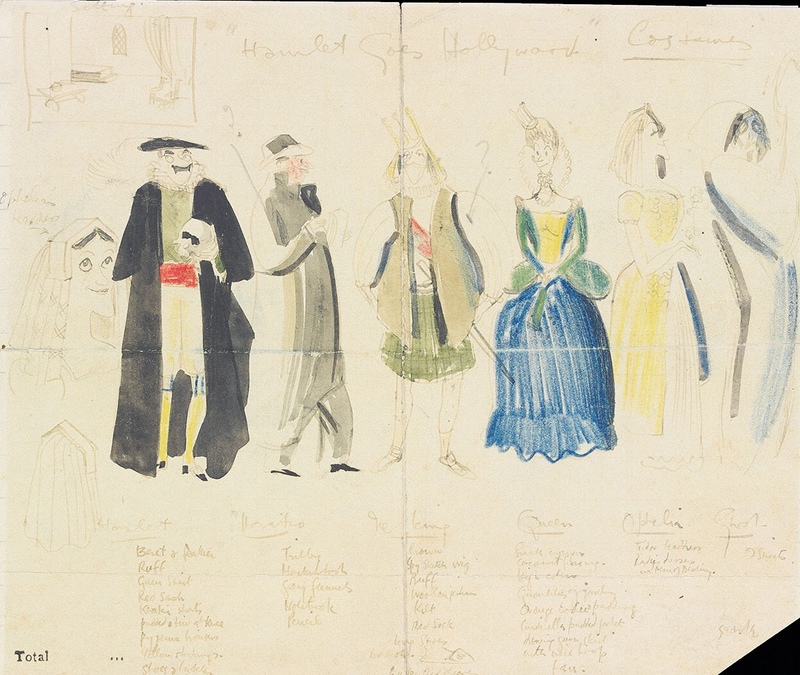 Artist and satirical cartoonist Ronald Searle designed costumes for “Hamlet Goes Hollywood” whilst a POW in Changi Jail, Singapore, during WWII. 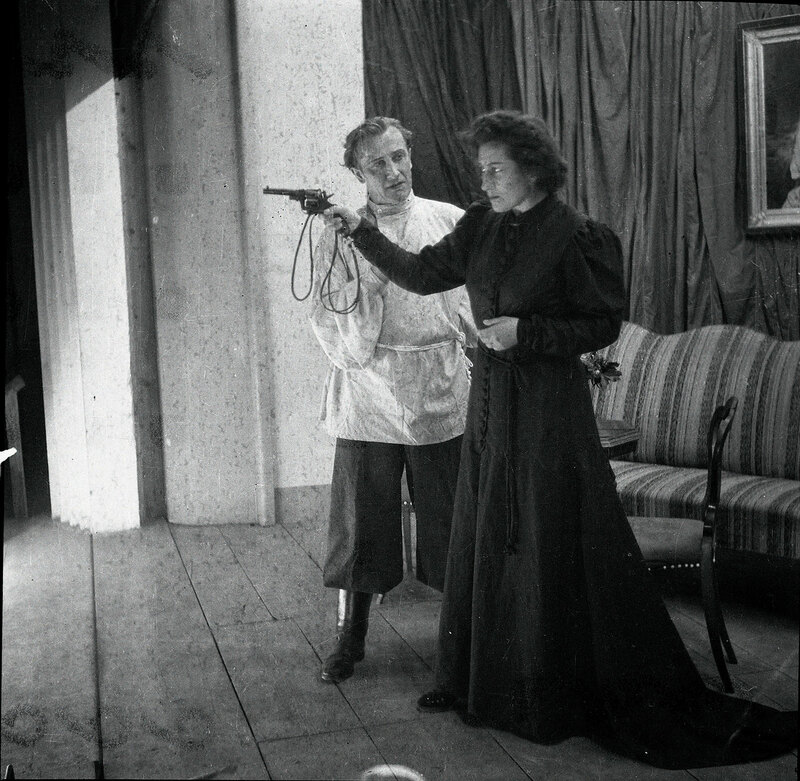 This version of “Hamlet” was a revue sketch which transformed the play into an American thriller. Searle’s drawings make use of every inch of the paper, with notes and sketches in the margins and a cast list on the reverse. 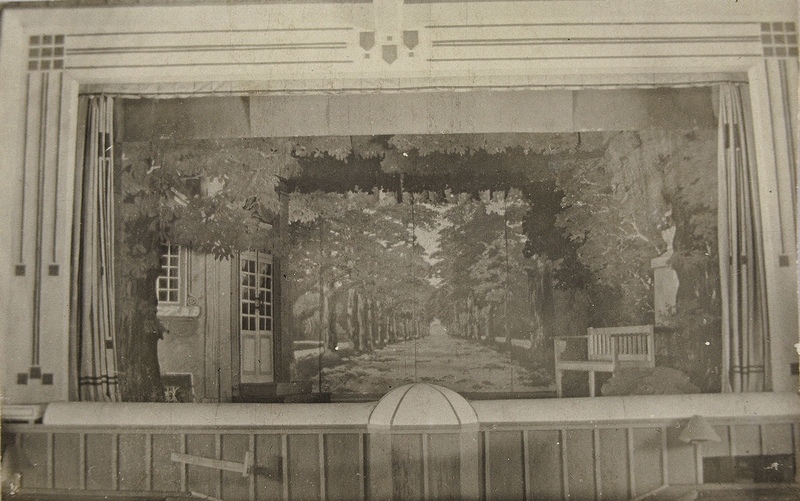 The Front Theatre was a travelling theatre of the 7th corpus which visited army units and organized performances for the civil society (from July 1944). They created their repertoire in its entirety: besides a whole series of one-act plays and sketches, also the so-called “Partisan Sound Weekly”. In the photo they are singing “Sound Weekly” at the meeting in Podgrad. 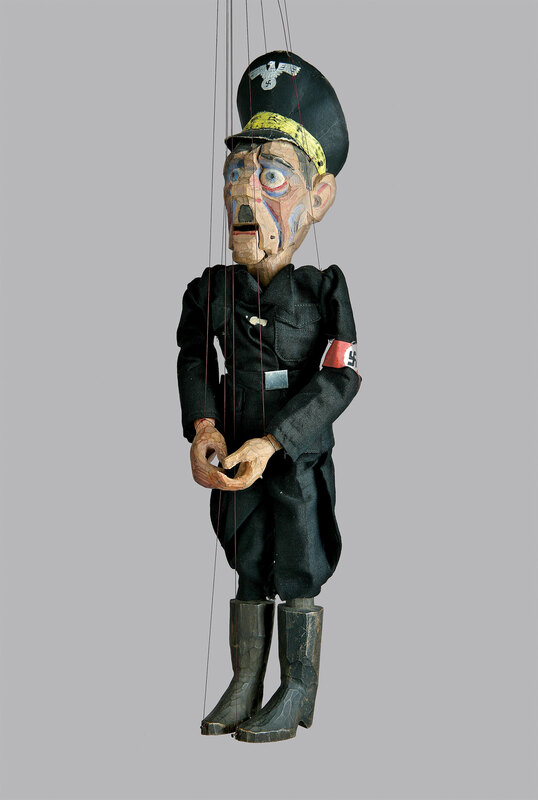 The history of the Partisan puppet theatre began in winter 1943. 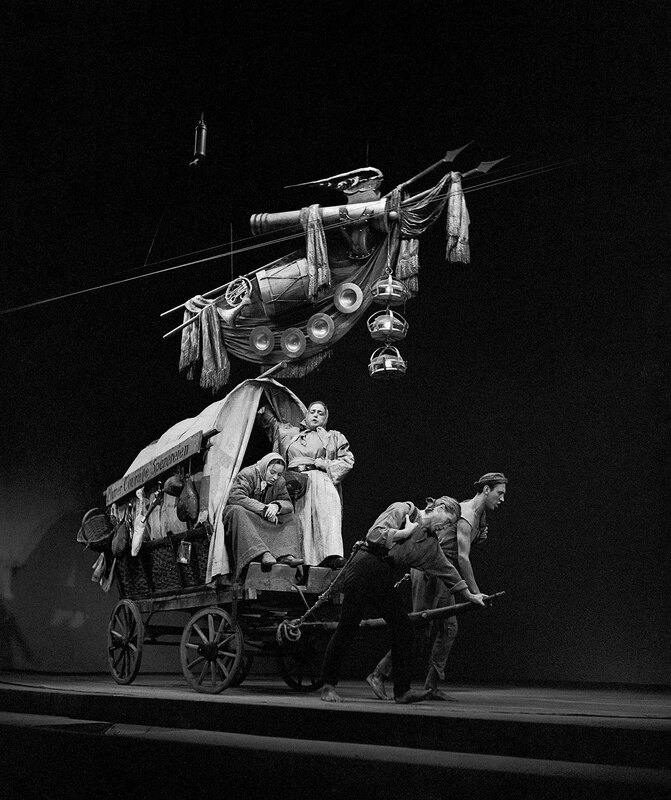 Lavrič, who was from a family of puppeteers, made a first puppet of courier Jurček. The painter Nikolaj Pirnat drew sketches for the heads of Hitler, Lili Marlen etc. 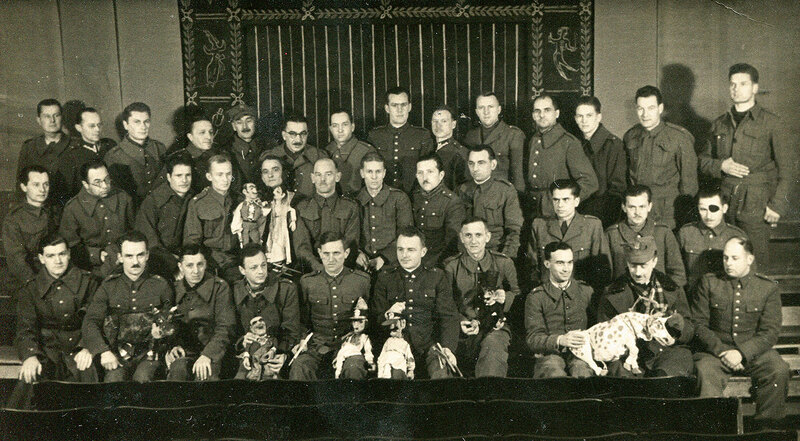 The first performance – for adults – of the Partisan puppet theatre took place in the fire brigade station in Črmošnjice on New Year’s 1944. Puppeteers authored the text themselves. 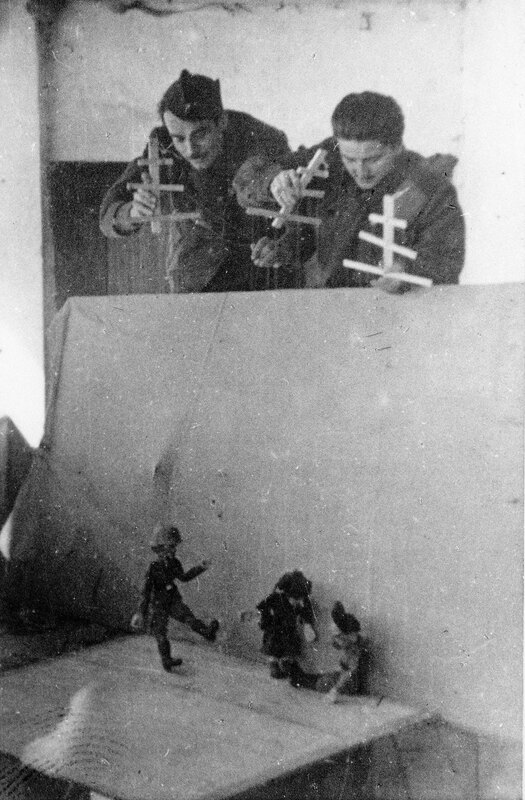 In the photo: Lojze Lavrič and Dušan Povh manipulating the puppets of “Jurček and Three Thieves” in the fire-brigade station in Črmošnjice. Rehearsals took place in the priest’s quarters, and the premiere on the premises of the fire-brigade station in Črmošnjice in January 1945. Poster by ENSA, the entertainment agency for British armed forces, presenting Russian ballet in 1940.